If we were to send teams of ‘UN development inspectors’ into the United States, the results would not be pretty. First, they would discover a nearly total disconnect between global commitments and domestic politics. Mr Bush has not discussed America’s commitments at Johannesburg with the American people (and perhaps his aides have not even discussed them with the President). Jeffrey Sachs (2002), ‘Weapons of Mass Salvation’, The Economist, 24 October. In Units 1 and 2 we set about defining the theoretical premises of sustainable development using the tools of analysis provided by ecological economics. Then, in Units 3 and 4, in putting forward the business case for sustainable development, we extolled the virtues of the market mechanism and how the market – as arguably the most powerful institution within the political economy – provides, perhaps, the best prospect of engineering the paradigm shift necessary for sustainable development to proceed. Unit 5 then concentrated on the important task of monitoring sustainability and how, without measurement, sustainable development is unlikely to be managed effectively. In this unit, the final unit in the course, we bring together all these themes in contemplating what kind of policy environment is most likely to foster their development. A key argument emphasised throughout this course is that the market is the vehicle most likely to deliver sustainable development. The main aim of this unit is to contemplate what kind of policy environment is most conducive to the realisation of sustainable development harnessing the power of the market. In pursuing this aim we compare and contrast the approaches taken by different nation states. This discussion will necessarily involve a critique of why it is that some countries around the world have been more proactive than others in terms of fulfilling their international obligations as defined by the various multilateral agreements on sustainable development. In Unit 5, part of the discussion was devoted to ‘greenwash’ and how corporations are capable of putting a positive spin on the nature of their activities to give the impression of being committed to sustainable development when this is not the case at all. It is worth noting, at this point, that greenwash is not the exclusive domain of corporations. Governments – or more precisely politicians – are more than capable of indulging in a bit of greenwash. Statements like ‘the government is strongly committed to the objectives of sustainable development’ are not uncommon, but what do they mean? Oftentimes, this can be attributed to having a poor understanding of the meaning of sustainable development. On other occasions, of course, the rhetorical statements are more expedient than statements about reality. Where governments are serious about developing policies to promote sustainable development, a range of policy instruments are available that can be used to harness the power of the market with a view to altering incentive systems and inducing a change in behaviour. According to the International Institute for Sustainable Development, these include: ‘carrots (subsidies); sticks (emission regulations); sermons (education and voluntary instruments); and direct intervention (direct purchases, investments and the creation of markets). For an overview of the kinds of policy tools available to governments click on the Economics and SD page at the International Institute for Sustainable Development website, paying particular attention to the Policy Instruments link. While market-oriented approaches are in vogue, and they can certainly enhance a country’s capacity to move toward sustainable development, it is worth noting that in some circumstances, assigning correct pricing to environmental resources may prove impossible or superfluous. In simple terms, the goal of increasing the welfare of society through changing relative prices is all very well, but only if society remains within what might be referred to as its ecological budget constraint. This requires an economy to meet human material needs while maintaining the stock of natural capital. If changing relative prices does not do this, then the market mechanism by itself is clearly not be sufficient to secure ecological economic efficiency, and some intervention on the part of the state will be necessary. In 2002, The Economist magazine published a short article entitled Insuring a brighter future: how to hedge against tomorrow’s environmental risks. Usually quite doctrinaire in its advocacy of the free market, The Economist is not recommending interventionism on a grand scale, but as the following extract suggests, editorial sentiment may be softening in that it recommends an activist role for the state in terms of shaping institutions that will impact on the marketplace. Critique this reading with your classmates. Has the world become a riskier place since 2002? To the extent risk has increased/ likely to increase because of environmental factors, what steps might be taken to mitigate this risk? The European countries have shown considerable leadership in the move toward sustainable development, most notably Germany, the Netherlands and the United Kingdom. These countries are not beyond criticism, of course, and some of the most vocal criticism emanates from within these countries (see, Coward (2002) for example). The British Government’s enquiry into the economics of climate change has proved to be very influential internationally and at home, receiving quite resounding endorsements from influential figures within the academic and business communities. Take a look at this 1:55 minute YouTube clip from BBC News report on the release of the Stern Report. Refer now to Reading 6.2 by Nicholas Stern (2006) entitled ‘What is the Economics of Climate Change’, which appeared in the World Economics, volume 7, no. 2, pp. 1-10. Do you think the British have progressed in terms of policy for sustainability since the release of the Stern Report? If so, how? If not, why not? Share your thoughts with your fellow classmates on these and related issues. 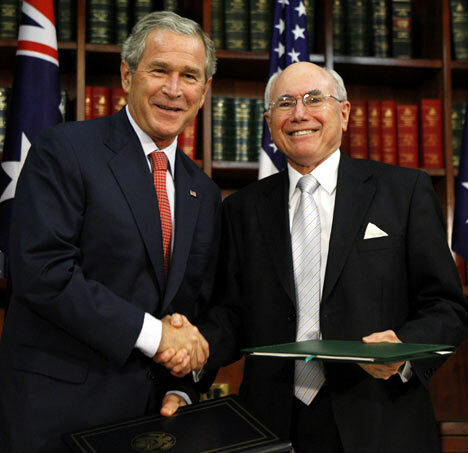 Of those governments opposing any coordinated policy to address climate change, the Bush administration in the US and the Howard administration in Australia were arguably the most vocal. Until the election of the Kevin Rudd government in 2007, Australia was one of just two countries refusing to sign the Kyoto Protocol that sets targets for the reduction of greenhouse gas emissions; the United States being the only other developed country refusing to sign. The previous Australian government, led by John Howard, was heavily criticised by the Australian environmental movement, Dr Clive Hamilton, former Director of The Australia Institute, among the more prominent critics. Towards the end of the Howard term in office, even the Business Council of Australia abandoned its neutral opposition on Kyoto, as some companies complained that non-ratification could amount to lost business opportunities in the high growth sustainability-related industries. After the initial euphoria of finally signing the Kyoto Protocol, the Rudd government came under close scrutiny, as it did not fully deliver on its election promises with regard to sustainable development. A long-term target for 2050 of a 60% reduction in greenhouse gas emissions was set, but this was perceived to quite modest (the conventional wisdom being that a cut of at least 80% is needed). The Rudd government also distanced itself from key recommendations of its own Garnaut Climate Change Review (updated in 2011) on emissions trading, namely that 100% of emission permits should be auctioned, and that there should be no ‘compensation’ to coal-fired electricity generators. Partly as a result of this indecision, Rudd lost the confidence of supporters within his own party, and was ousted by his erstwhile deputy, Julia Gillard. Under pressure herself after holding on to government by the skin of her teeth in 2010 with the support of the Greens and independent MPs, Ms Gillard was successful in introducing a carbon tax in Australia in November 2011. Watch this Australian School of Business report on ‘The Business of Climate Change’, uploaded on 11/08/08 (3:44 mins). How effective do you think carbon trading will be in changing price signals in the market to induce a change in behaviour on the part of business? Exchange views with classmates on this topic, presenting sound argument to support your position. If Australia’s international image was tarnished by its intransigent stance on the environment, the reputation of the United States was subject to even greater damage during the Presidency of George W. Bush. With strong connections to Big Oil, this is perhaps no great surprise, but the contrast with the position taken by the Obama administration could not be more stark. A key element of the argument advanced for not taking action on climate change by Bush was that it would undermine economic growth and this would lead to job losses. Obama’s message is the complete opposite. The creation of a green economy is critical to job creation and economic prosperity. Activity 1: A new chapter on climate change? In this YouTube video clip, President Barack Obama gives a short speech (3:53 minutes) on what he refers to as ‘A New Chapter on Climate Change’. Has Obama lived up to the promise? What is your assessment of the ‘green-ness’ of his administration? Share your thoughts with classmates on this and related issues. Refer now to Reading 6.3 by McNeill and Williams (2007) entitled: ‘The employment effects of sustainable development policies’, which appeared in Ecological Economics, volume 64, pp. 216-23. This article focuses on the case of timber workers in Tasmania, Australia, but on the employment effects of sustainable development more broadly. How has the Tasmanian economy been faring in the light of the winding back of the timber industry? Google search this topic and share your findings with classmates. Could the situation have been managed any better than it has to date? The main aim of this unit was to reflect on the kind of policy environment most conducive to the realisation of sustainable development. To this end we focused on the range of policy tools available to governments that are capable of harnessing the power of the market to bring about change in relative prices and thereby induce a change in the behaviour of economic agents. We also observed that there are limits to the power of the market and that while relative prices are capable of sending the right signals to those allocating resources, sometimes these signals will not be sufficient for society to remain within its ecological budget constraint and achieve ecological economic efficiency. In these circumstances, alternative institutional arrangements will have to be put in place. In reviewing the type of policy mix that governments might employ, we compared and contrasted the approaches taken by different nation states including the Netherlands, Germany, the UK, Australia and the US. Clearly, the Europeans appear to be leading the way at this point in time. They have been more proactive than Australia and the US in terms of fulfilling their international obligations as defined by the various multilateral agreements on sustainable development. It is likely, therefore, that businesses in these economies will be better placed in the future to take advantage of the business opportunities that a commitment to sustainable development provides. Under the new leadership of Julia Gillard and Barack Obama, however, there is clearly a change in direction in these countries. Correct pricing; ecological budget constraint; Kyoto Protocol. OK – that’s it folks. I hope you benefited from having done this course. Make a few short notes on what you have learnt during this module. When you have completed this task, reflect on the key themes that permeate throughout. Importantly, what are the business opportunities? How might they be realised? Coward, R. (2002). ‘For ‘sustainables’, read ‘sustaina-balls’’. The Ecologist, 32(4), p. 10. Hamilton, C. (2001). Running from the Storm: The Development of Climate Change Policy in Australia. Sydney: University of New South Wales Press.